Connemara marble angel pendant features silver plated accenting along with a blue lace agate. The Connemara marble that is featured in this heart necklace is the only natural green marble in the world; fittingly, Connemara marble is only found in Ireland. This Connemara marble angel necklace features a marble body along with silver plated wings and a blue lace agate head. 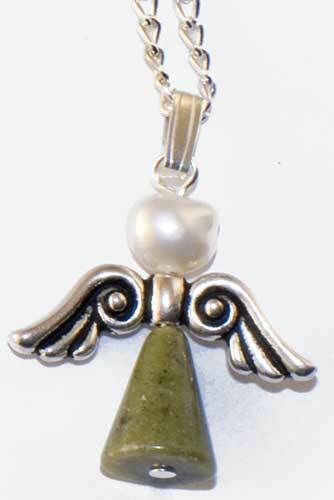 The Connemara marble angel measures 7/8" wide by 1" tall, including the jump ring and the chain bail, and an 18" long silver plated chain is included. 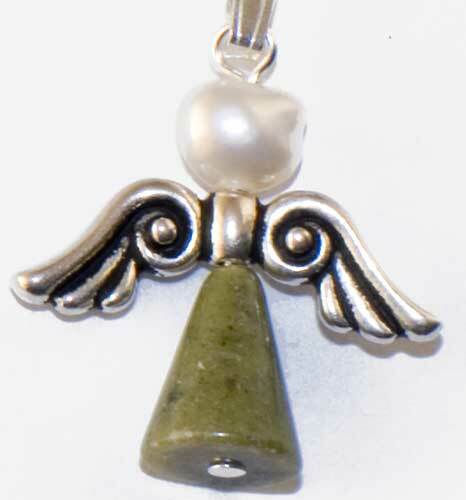 The Irish angel necklace is made in Kilkenny, Ireland by All That Glisters; it is gift boxed with a Connemara marble history card, complements of The Irish Gift House.